This is one of those books I wish I could share with my grandmother- it has all the elements of that good "yarn" she was always referring too. The setting is just as it was in the first novel of the series and I’m lucky enough to have all the ones in the middle on my shelf ready to curl up with on a winter morning. These novels have an element of Call the Midwife about them which makes me a bit nostalgic- I wasn’t personally around in those eras but my mother and grandmother were and my mum tells me stories that are similar to the Call the Midwife series and these novels as well- reading them makes me feel closer to my past in some way. 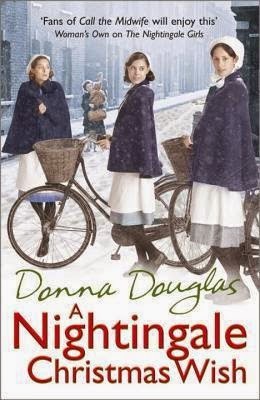 A Nightingale Christmas Wish is the title only because this book is set around December right before the official start to the Second World War and the Nightingale hospital has to face their normal routines with a cloud of doubt about if they will even be able to remain open if war is declared. It’s interesting to read about the intense dedication of the nurses as well as the doctors in a time when there was every reason to believe that the people and place you worked and lived could the next day be flattened and people’s lives lost. Donna Douglas creates an interesting era for love to bloom - with all that uncertainty and doubt these new connections are so tenuous and yet there seems to be a more honest love occurring than in novels set in a contemporary setting. Without all the technology, social media and ease of today’s way of life a lot more effort and honesty had to be put into relationships. Because this novel has the nurses in it who appear throughout the series I think there’s something to be said for reading them in order- however I wasn’t able to do that this time and despite having some gaps in the career paths of the women I still gained a lot of enjoyment out of this novel’s romantic story lines.